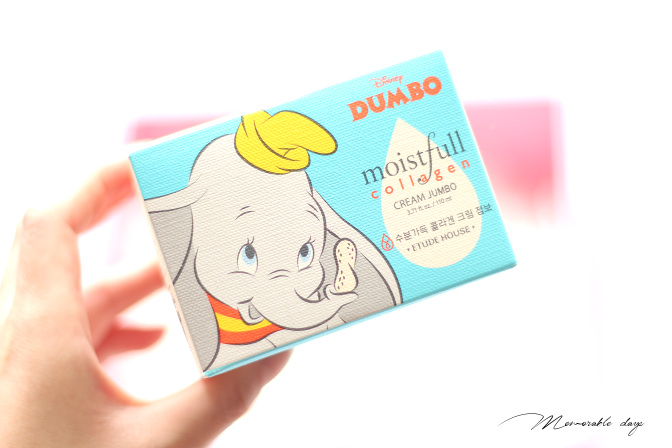 Review: Etude House Moistfull Collagen Cream x Disney Dumbo | Memorable Days : Beauty Blog - Korean Beauty, European, American Product Reviews. Hi all! Excited blogpost today! 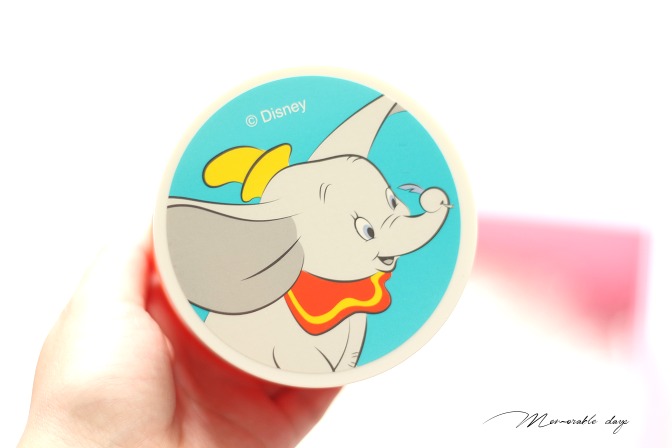 A week ago I blogged about the new collaboration from ETUDE HOUSE x Disney Dumbo. 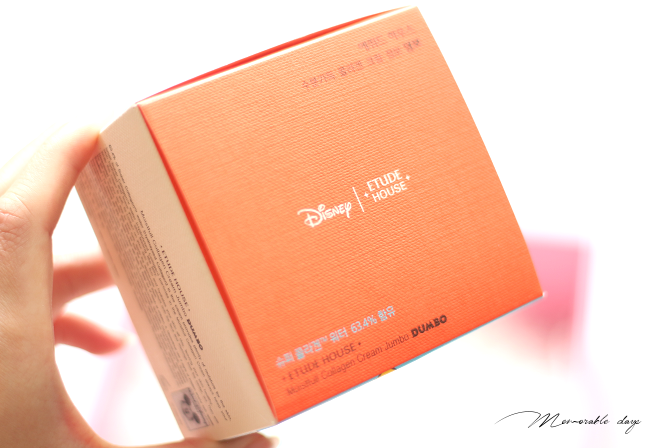 In collaboration with Disney Dumbo they created an adorable packaging for their moistfull collagen skincare line. ETUDE HOUSE sent a few items to me to try them out. 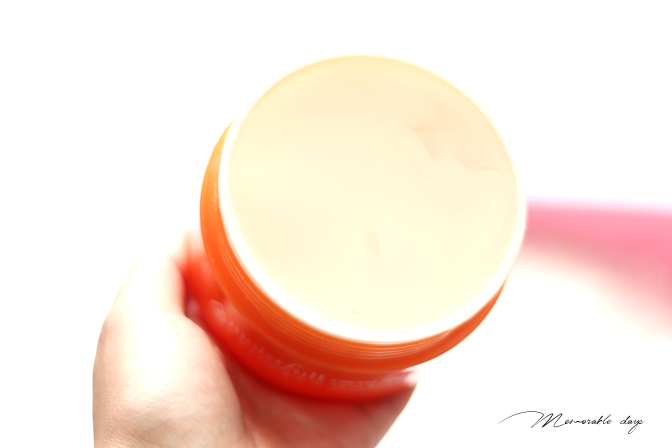 I will be reviewing the moistfull collagen cream in today's blogpost! 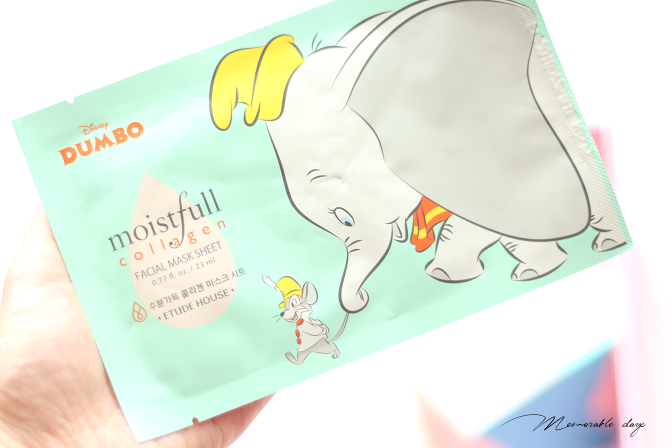 I also received the sheet mask of this line with the Dumbo packaging. The packaging is too cute to use, I don't want to tear the packaging, but I do want to try the mask out haha dilemma. Just in case you are curious about the ingredients of this sheet mask, you can also check it on cosdna.com: Water, Butylene Glycol, Hydrolyzed Collagen , Glycerin, Diethoxyethyl Succinate, Citrus Paradisi (Grapefruit) Fruit Extract, PEG-60 Hydrogenated Castor Oil, Polyacrylic Acid, Cellulose Gum, Potassium Hydroxide, Ethylhexylglycerin, Adansonia Digitata Fruit Extract, Sodium Polyacrylate, Sodium Hyaluronate, Alcohol, Phytantriol, Poloxamer 407, Ammonium Acryloyldimethyltaurate/VP Copolymer, Glyceryl Caprylate , Disodium EDTA, Phenoxyethanol, Fragrance. This is a very popular cream from ETUDE HOUSE and has been in the market for a very long time. It's now sold in a jumbo size, extra big and contains 110ml! There are small collagen water particles (hydrolyzed collagen) in the moistfull cream (63.4% super collagen water), which is how it keeps the skin hydrated. When you apply it on the skin it is firm and hydrates your skin all day, leaving your skin healthy and plump. It absorbs quickly without leaving a sticky feeling, it improves the skin texture and it increases moisture after 5 days, at least that is what they claim. I am giving them 100 points for adorable packaging haha, omg too cute! 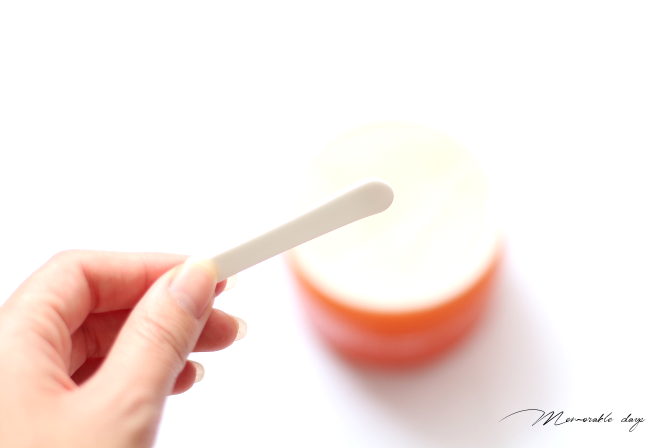 Once you twist the cap it has a translucent protection layer, when you remove that, you can see the product. It comes with a spatula which makes it hygienic. 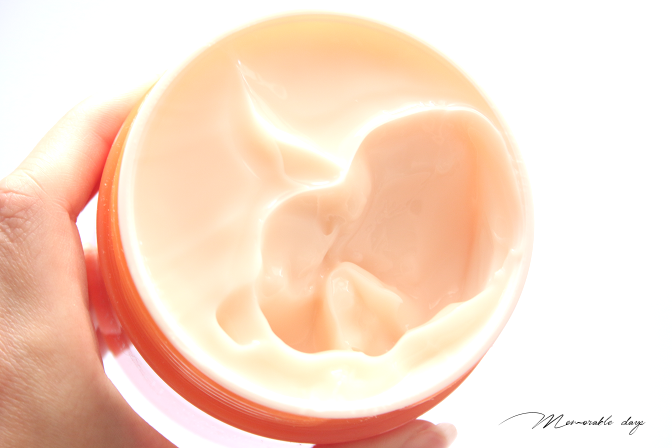 This cream should be used as your last step of your skincare routine. Grab a bit of product out with the spatula. Apply the appropriate amount onto the face and massage from the center, out. You can also apply it on your neck too. You can also find the ingredient list on cosdna.com. This product does contain alcohol and fragrance but it's at the end of the list, which means the amount of it is small compared to the rest. This has a light gel texture that can be easily spread. I almost thought that there is silicone in this product, because it feels like that, but there isn't. You don't need much, a little goes a long way. It soaks into the skin within a minute. I love that it has a cooling effect once you apply it on the skin. It does leave a sticky feeling, but once its soaked into the skin it turns moist and soft. It has a lovely scent - fresh, floral scent. Some people might think it's overwhelming since it's pretty strong. I normally don't prefer scented products, but I don't mind this one. It's sold at etudehouse.com, their official worldwide website. The cream in jumbo size is sold for USD$20.40 and the sheet mask is sold for USD$2.60. Very well priced for such a big size of a cream. I am liking this cream and I can imagine that many people would love this, which is why they came with the jumbo size I think. It has a nice gel texture that's very light, it spreads easily and soaks within the skin within a minute. It does feels sticky at first but once it has fully absorbed it feels soft, refreshed and very moist. It feels very moist for such a lightweight cream. I am a big fan of products with a cooling effect and this is one of them. This product is perfect for in the evening, but you can also use it in the morning as well if you want a moist-boost. I don't want to wait after I apply skincare so I choose to use it in the evening. I just want to go straight to my make up routine without waiting until it's fully absorbed even though it's just a minute. I have been using it for 2 weeks now, I didn't feel significant change regards the moisture level of my skin neither the texture, but I don't have any tools to proof that it has or hasn't either. I will keep on using this cream and hopefully I can feel some difference after a while. I can imagine that some people might think the scent is overwhelming, but I do like the scent of this product, it's a personal preference. note: this product was sent to me for review purposes, this didn't affect my opinion about the product. I didn't receive money to write about it, see disclaimer.